Rihanna finished her 777 tour in New York on Tuesday. Mel Ottenberg describes this look as “Debbie Harry goes ‘hood'”. 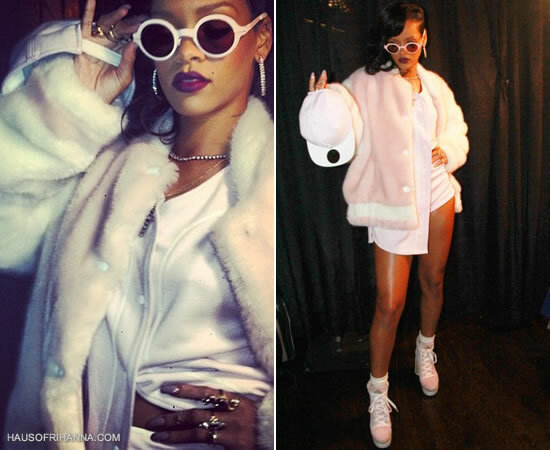 Rihanna wore a custom-designed faux fur bomber jacket, baseball shirt and shorts by Adam Selman. Her matching pink shoes were custom-made for her by Kenzo. The look was finished with Mykita‘s Regina sunglasses and diamond hoop earrings by Sidney Garber. You can also spot her beloved Amy Zerner serpent ring.